Jobs180.com is an IT company focused on providing innovative solutions that enable schools to equip its job-ready graduates meet the complex demands of the current generation's employers, based on the changing needs of the job-seeking millennials. Jobs180.com is also focused on providing innovative solutions to employers in response to the complex needs of job-seeking millennials. To empower job seekers attain a better career by providing online tools to build a credible and impressive resumé and market themselves effectively. To prepare fresh graduates for employment by equipping them with the knowledge and skills to begin their career search successfully. To mobilize the recruitment and HR processes of employers by providing online tools and database for them to source and manage job applications. We provide next generation tools to build an online resumé, create a cover page and a customized URL (ResuméLink) for personal branding and to easily share the resumé. We provide a CareerSite to feature job vacancies and a resumé management system (TeRA) to store and manage the job application database, all at the most competitive industry pricing value. We provide a free career orientation program (ResuméLink Orientation), a dedicated CareerPortal to provide internship and entry level jobs, and access to the Gateway system to support graduate tracer study initiatives. The ResuméLink is an online resumé with a personalized link. With ResuméLink, a resumé database that's updated real-time can be kept for a more effective applicant pooling. Also called the next generation resumé, the ResuméLink can be viewed online anytime and anywhere. Users can personalize their own link and creatively present their profile to the different companies they apply to. The ResuméLink is designed for the user to easily secure his/her information through the privacy settings. The ResuméLink can be downloaded as a PDF file or it can also be printed out-a plus for applicants on-the-go. Personal information is more secure because you can set your privacy settings and choose the information you want to share. ResuméLink is updated real-time, and can be viewed online or shared in a print-friendly hard copy. Shorter hiring process using the ResuméLink. Employers can easily view the applicant's information. The ResuméLink is your professional profile page. Give your ResuméLink, or print your own ResuméLink business card so you can be ready anytime a employment opportunity comes knocking. Introduction to the Next Generation Resumé (ResuméLink). Personal Branding: Dressing Up for Success. 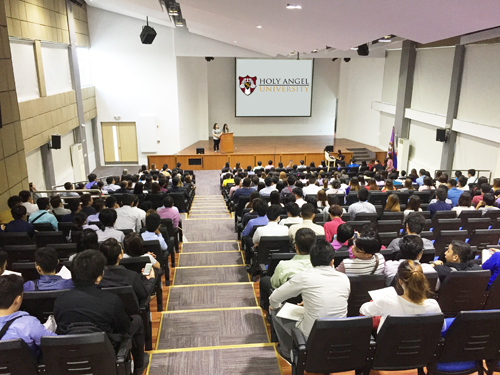 Job Interview Tips: Based on current trends and updates straight from the HR officers of different companies. 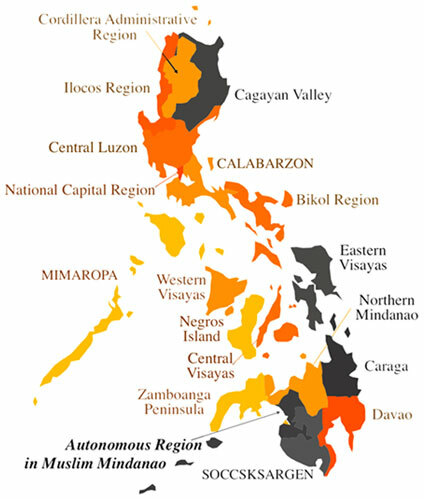 This orientation is very important to maintain accurate statistics for the online tracer. The Gatew@y Tracer System is an online tracer system that utilizes the ResuméLink to track career placement. With Gatew@y, schools can check the employment status of their graduates. The Gatew@y Tracer System is a secure online portal where schools can view their graduates' employability. 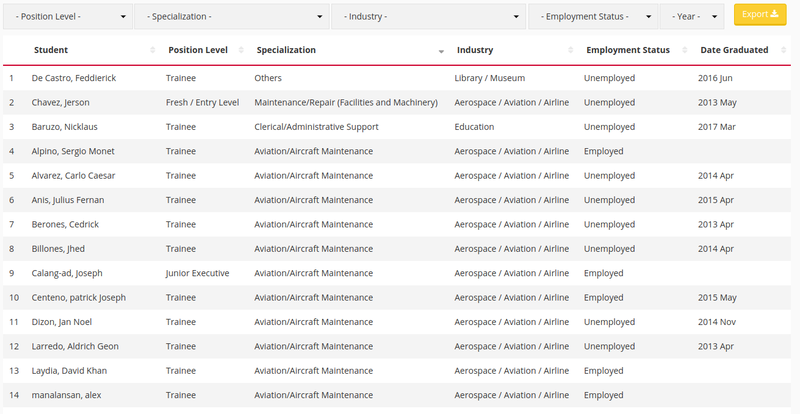 Real-time employment status such as the company and industry of the alumni are all user-generated information gathered from their ResuméLinks. To aid the schools in providing the best employment opportunities available, Jobs180.com has developed a dedicated career portal for school partners. School partners can manage their own free CareerPortal. 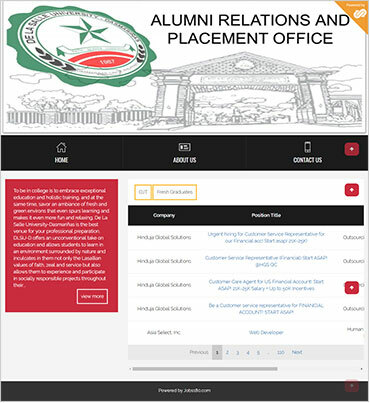 Instead of searching elsewhere, students and alumni can be redirected to the school-branded CareerPortal, a stand-alone micro site where they can apply for OJT or entry-level positions. Get your own unique web address: http://schools.jobs180.com/SchoolName. Personalize your CareerPortal with school colors and school logo. Internship and entry level jobs are automatically featured on your website to address your student’s needs. Graduates can sign up to create their online resumé and ResuméLink. Jobs180.com wants to help the schools offer the best options available in the job market to its graduating students. 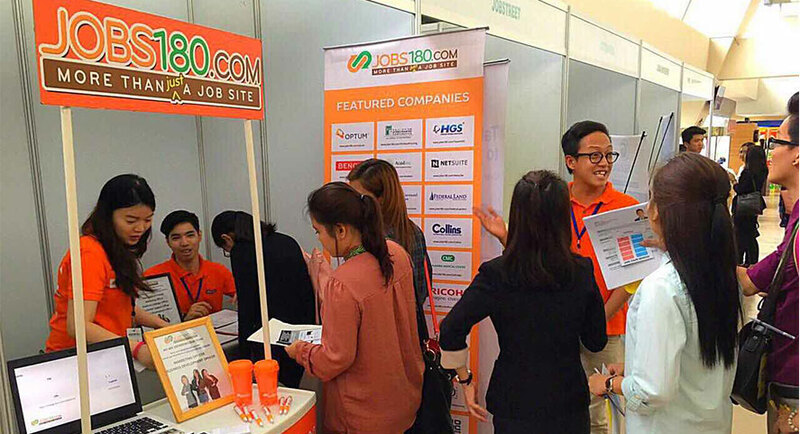 Jobs180.com can help organize a school job fair within the campus and ensure that there will be a good mix of employment opportunities ranging from different sectors of businesses: manufacturing, FMCG, BPO and other services-oriented industries. Schools can conduct job fairs with less stress while bringing more opportunities to your students. We can provide assistance by inviting companies and by powering the event registration. A program for training school representatives to conduct ResuméLink Orientation even to lower years. You can customize it according to the needs of your students. Introduce ResuméLink to Seniour Highschool up to 3rd Year College Students! Check all your students who registered to create a ResuméLink! Jobs180.com will provide a certification for you as an official ResuméLink Trainer! Jobs180.com is growing fast and is very active in school partnerships. Through the school's career activities, your company can join and expose your brand to students with less hassle. With an expansive network of over 400 schools nationwide and growing, you can be connected to a large pool of fresh talents yearly because 80% of fresh graduates are using ResuméLink in applying for a job. Customize and manage your own career page. Your own customizable micro site will increase your online presence to your target job seekers. Boost your brand by redirecting job seekers to your the CareerSite, a stand-alone site where your job vacancies are advertised. 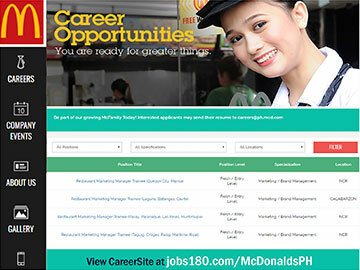 The Jobs180.com CareerSite is a micro site that Employers can use as a dedicated landing site for their job vacancies. Customize your very own web address http://www.jobs180.com/AwesomeCompany and promote it. Upload your logo and product offerings to reflect your corporate brand. Upload photos, videos, your events calendar and a map of your location. Display your job vacancies and manage job applications online. Join our career events and introduce your company personally to the future professionals. Intensify your brand pull by placing strategic advertisements on our banner spaces. Get the right candidate that best fit your required qualifications by posting your job vacancies to our fast-growing database. Get the candidate you want with powerful refining tools to find that person that best fit your needs. With The e-Resumé Archive system, you can build your own online resumé database without worrying about purging. 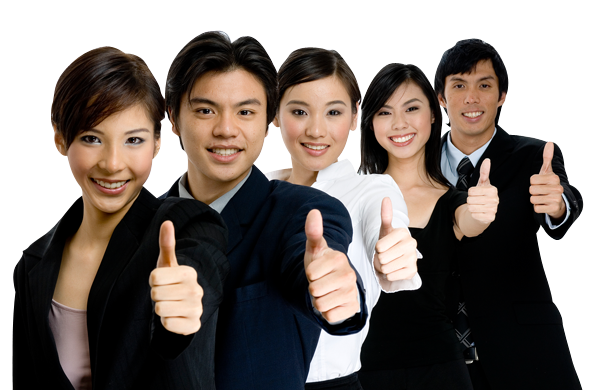 TeRA works hand in hand with the CareerSite. It offers an interactive solution to posting your job advertisements, searching resumés and managing your job applications. It’s your very own online resumé database minus all the headache of maintaining it.